Our 53 hillside-acres of vineyards are located in the eastern hills of southern Alexander Valley, at the confluence of the Chalk Hill and Knights Valley appellations. The valley is emerging as a leading location for producing Bordeaux style Cabernet-based blends to rival the finest from the Napa Valley. Alexander Valley’s hillsides and mountain locations where diverse, nutrient-deficient soil types and microclimates are most prized, are proving ideal for developing distinctive wines of concentrated varietal character, deeply rich fruit forward flavors and aromas, alongside lithe tannins with demonstrated ageability. Millions of years ago, a period of seismic upheaval and volcanic activity created the dramatic vistas of Alexander Valley in Sonoma County. A low coastal range flanks the valley on the west, while its eastern border is defined by the majestic Mayacamas range. Over many years rich, red volcanic soils washed down the valley’s hillsides, combining with sand and gravel deposited by the Russian River. As a result, the floor of Alexander Valley today is incredibly fertile, while hillside vineyards enjoy a wide variety of micro-climates and the desirable low-nutrient soils that give the finest wines their intense character and complexity. Over time, the vineyard reveals itself, and viticultural fine-tuning is key. As wine estates mature, vineyard knowledge gains importance, and while each vintage brings its own unique story, certain themes emerge. Working closely together, viticulturist Phil Freese and winemaker Jesse Katz combine technological wizardry like satellite mapping and climatic analysis from vineyard weather stations with insights that can only be gained from walking the vineyard nearly every day of the year. Vineyard blocks have been evaluated and redeveloped with the most appropriate rootstocks and clones, vine row orientation and micro-block irrigation. With limited access to water, no frost protection has been installed, requiring even closer vigilance, with pre-pruning techniques used to encourage a fulsome budbreak each spring. 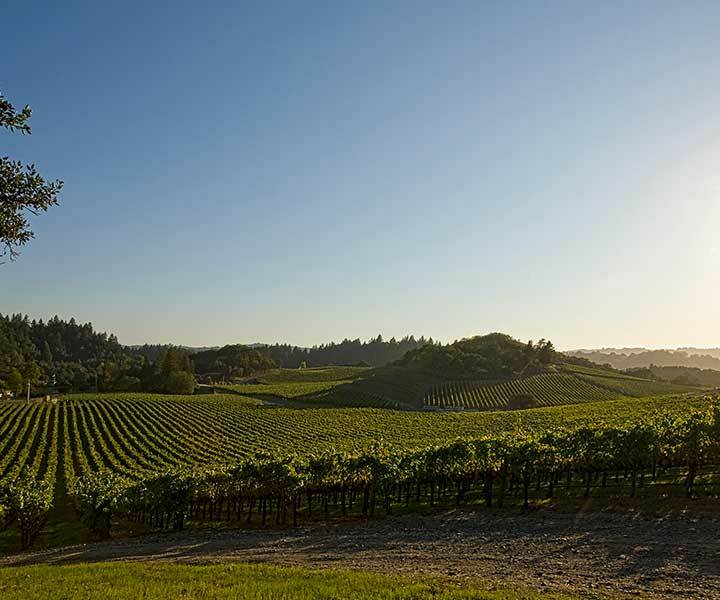 Our Estate’s diverse micro-climates are ideal for growing Bordeaux varieties. Warm temperatures start early in the year and continue through October for late, yet ideal, ripening conditions. A very slight marine influence affects our Estate by giving it the diurnal temperature differentiation—of warm days and cool nights—of classic winegrowing regions throughout the world. Daytime temperatures are very similar to Napa Valley's Oakville District, where legendary vineyards such as ToKalon produce stunning Cabernet Sauvignon each season. However, nights at Lancaster Estate are approximately three degrees warmer than Oakville. These milder nighttime temperatures are both cool enough to maintain optimum acidity in grapes and warm enough to allow them to continue ripening throughout the growing period. This extended growing period is vital to slowly develop full physiological varietal maturity and provides an optimum balance of sugar, acid and flavor development in each grape cluster. We actively manage vine vigor and encourage low yields by employing classic viticultural practices such as shoot thinning, cluster thinning and deficit irrigation. Lancaster Estate’s hillside orientation, higher-density vine spacing, and low-nutrient soil compositions naturally control vine vigor and reduce yields. From these lower yields emerge wines of deeply concentrated flavors and complexity since the vine’s energy is directed at the struggle for survival rather than excessive green growth. These are wines with truly distinctive character.